I am the coordinator of Sustain, the UK’s alliance for better food and farming. I’m also a trustee of Feedback, the global food waste charity; a trustee of the social enterprise Growing Communities, which supports local communities to set up ethical food trading enterprises; a trustee of Food Matters, a not-for-profit organisation that helps people and institutions to implement better food policies and practices; and a member of the board of the UK-wide Sustainable Food Cities network. What inspired you to study Food Policy? One of my first jobs after my undergraduate degree was working as a member of the resident staff team at Schumacher College, a centre for ecological studies based in Dartington, Devon. Inspiring speakers and students came from all over the world to share their knowledge and experiences. During my four years working there, helping with the marketing, cooking, cleaning and supporting students, I felt a growing need to apply what I was learning in practice. And food felt like a good subject to choose, through which a very wide range of environmental, cultural and social justice issues could be explored and solved. Professor Tim Lang came and spoke on one course, and I ended up serving him a glass of wine during my bar duty. He enthused about food policy, and I was hooked. I returned to London, started volunteering at Sustain and the Food Commission (a small and feisty campaigning organisation), and undertook the Masters in Food Policy on a part-time basis, led by Professor Tim Lang. My main role is as coordinator of Sustain, the UK’s alliance for better food and farming system. We work together with our 100-or-so member organisations to achieve step-changes in food and farming policies and practices, for the benefit of public health, good food and farming livelihoods, environmental conservation and improved farm animal welfare. Some of our projects support many more groups and individuals working at a local level, helping them – through collaborative policy and advocacy activities – to overcome shared barriers to change and to demonstrate how their models of innovation and good practice can be adopted more widely. We play a convening and campaigning role, helping a wide range of groups and initiatives work together and amplify their voices, to become more than the sum of their parts. Serving on the London 2012 Food Advisory Group, helping to win the first ever sustainable food standards for the Olympic and Paralympic Games, and convening the London 2012 Sustainable Fish working party that secured robust sustainability standards for all wild-caught fish served at the 2012 Games. Building on this, back in 2009, instigating the Sustainable Fish Cities campaign that has now gone on to secure pledges to serve only verifiably sustainable fish from caterers that together serve over half a billion meals a year. Working with Food Matters and the Soil Association to run the Sustainable Food Cities network, now involving over 40 UK cities in planning and implementing healthy and sustainable food plans. FoodSave, working with Feedback, the Sustainable Restaurant Association and the Greater London Authority, to help food businesses divert hundreds of tonnes of good food to useful purposes, that would otherwise have gone to waste. How has Postgraduate study helped you secure your position? Postgraduate study helped me to professionalise my interest in food policy, to be able to prove to employers that I take this subject very seriously and have made a personal commitment (time and fee!) to taking this interest to a professional level. What is the most useful skill you use on a day to day basis from your degree? The masters in food policy helped me to understand and question the forces and institutions that shape what we eat, and how it is produced. It is not dramatic to say that these factors will in turn affect our life chances, health outcomes and the future ability of our planet to sustain us. The masters gave me a solid basis on which to build future understandings, connections, collaborations and advocacy work. Can you tell us a little about the impact prominent staff such as Tim Lang influenced your experience? The three main teachers on the course during my time were Professor Tim Lang, Dr David Barling and Professor (then Dr) Martin Caraher. They were all inspiring in their own ways, and I have gone on to work with all of them on research, advocacy and policy activities. 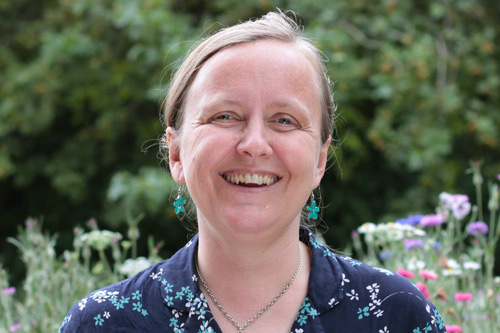 I continue to do so with Tim Lang’s successor, Professor Corinna Hawkes, who has recently become one of Sustain’s trustees. I have always been utterly inspired by their commitment, passion, knowledge, generosity with time and expertise, support for students, involvement in parallel and community projects, personal energy… You can tell I’m a big fan! I have tried to model my own approach to work on theirs. Further, I also appreciated and was very influenced by several of the visiting lecturers on the course. I went on to volunteer for two of them whilst also undertaking the part-time masters – Dr Tim Lobstein of the Food Commission, and Jeanette Longfield of Sustain. I was for a while Deputy Coordinator, and am now Jeanette Longfield’s successor as Coordinator of Sustain, following her retirement in 2013. What would you say to somebody thinking about studying a postgraduate degree? A postgraduate degree in food policy helped me ground my interest in healthy and sustainable food in the discipline of understanding the forces that shape our food and farming system. The Masters in Food Policy at City is special because it bridges the academic disciplines and practical application in the decision-making that affects what we eat and how it is grown. I was lucky in being able to combine a part-time Masters in Food Policy with voluntary, freelance and then full-time work in the food advocacy sector that I knew I wanted to dedicate my life to. The postgraduate study gave me the foundations on which to build the connections, experience, knowledge and impetus to do so. Hear Kath speak about her time at City and the ways in which it shaped her career.